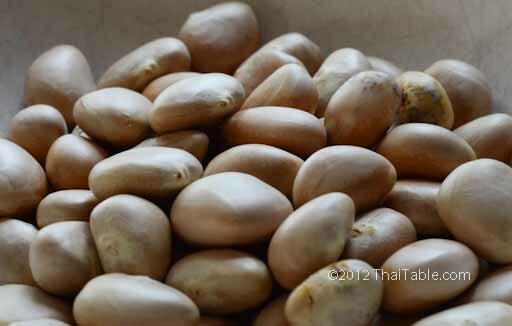 Jackfruit seeds are a bonus from buying jackfruit. A whole jackfruit can be big and heavy. Pieces of cut up jackfruit are available at Asian and Indian markets. They are wrapped in plastic and usually sold by the pound. A single jackfruit contains maybe 100 yellow fleshy pockets, and inside each there is a loose skin then a single large brownish seed. This skin usually comes off while cutting the yellow flesh open to get to the seed. The seed is a very thin, hard shell around dense off-white flesh. You can make a snack or curry from the cooked, shelled seeds.